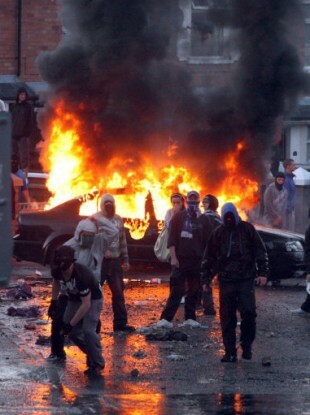 Trouble erupted in Ardoyne this year, surrounding the Twelfth of July march. A GROUP OF players from Crumlin Star football club in the Ardoyne area of north Belfast have been injured in an attack, according to the Irish News (print edition). One of the players, Anthony Braniff, 31, described how he needed stitches to the face, while another player had his leg broken, a third was stabbed and a fourth beaten with a golf club as they returned home from a day at the races in Dundalk, Co Louth. The players had taken the trip to try and “get away from any trouble”, Braniff told reporter Allison Morris. The Irish News claims that the men were attacked by a loyalist mob as they walked home from Alliance Avenue. A PSNI spokesperson said that no motive had officially yet been established for the attack. Email “Ardoyne footballers stabbed and beaten 'by loyalist mob'”. Feedback on “Ardoyne footballers stabbed and beaten 'by loyalist mob'”.